i don't get out much. but then, you already knew that. the ride of the falling rain is the longest distance i've undertaken this year, covering not far short of the full 162km, though the 120km in april along the lanesque gorge in provence felt slightly longer. and much as i adore my home island, the view from the road climbing the limestone cliffs along the gorge was little short of marvellous, even allowing for the less than pristine weather. and though i would claim nothing whatsoever for my descending skills, a lack of being able to see round french bends rather encouraged my temerity. i'm still trying to come up with a credible excuse for my total lack of climbing ability. age, maybe? at any rate, the knowledge that i needed to be sat behind an imac come the following monday morning placed a sobering restriction on my devil-may-care attitude. always assuming i ever had one in the first place. however, i'd probably be the first to admit to virtually no spirit of adventure whatsoever, based purely on the fact that i have no spirit of adventure whatosever. not for me a week's training camp around mount teide, or even a train journey to germany for this season's eurobike. i'm even sure my pallor equalled that of mrs washingmachinepost's beautifully laundered sheets when i booked last year's portland/sacramento trip to attend nahbs. hardly the stuff of which legends are made. not for me a multi-week trip into the unknown, with nothing but a set of cotton duck panniers to save me from total isolation. thankfully, there are those in the world of cycling who give not a fig for discomfort, danger and the unexpected, even if their day jobs would suggest otherwise. today, reza pakravan and steven pawley, both residents of london and respectively a financial analyst and investment accountant, clicked into gear this morning to undertake the infamous kapp to cape route, commencing from the north cape in the arctic circle and finishing 11,000 miles south in cape town south africa. though i've little doubt they have both experienced the dangers of cycling from a to b in london city, those are likely to pale by comparison to those likely along their chosen route. 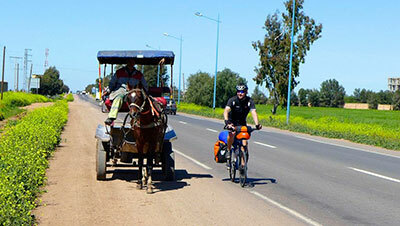 passing through daghestan and chechnya, neither of which are particularly renowned for their postcard shops and sidewalk cafes, they will also require to pedal through the sudan, iran and closer to the somali border than any of us would truly care for. daft though such a treacherous journey might appear, they've the added pressure of attempting all this in world record time, necessitating riding an average of 110 miles per day for 100 days. thankfully, before you or i begin to find ourselves seriously questioning their sanity (though you do have to wonder) and calling for the nice men in the white coats, their motivation for undertaking this somewhat mammoth task is the possibility of raising £28,000 for the charity azafady, a concern that intends building two new schools in madagascar. it is, according to the united nations, one of the poorest countries on the planet. my radio alarm switches on at 6am each and every morning. heaven knows why, because i have no need of arising much before 7:30am, but the knowledge that i have an hour and a half of dozing on and off is somehow rather comforting. mrs washingmachinepost would prefer that i listened to something other than radio four's today programme; i believe something a tad more entertaining might float her boat, but since the radio alarm is on my side of the bed, basically it's tough cookies. yet, though some will find 6am a rather early hour at which to be awake, we ought to at least pay a modicum of attention to the time those poor presenters must awake in order to be in the studio prior to the programme's start. and not only be there, but give at least a passing impersonation of someone who is bright and shiny personified. in my younger years, i delivered newspapers for some extra pocket money, a job that entailed arising mostly at 6am, but every so often, at 5:30am, for we each took it in turns to collect the newspapers from outside the town hall where the distributors unceremoniously dumped them each and every morn. it was at that point i learned the necessity of being at work at least ten minutes before one was due to start, otherwise everything was a rush and all blended unceremoniously into each other. so think back to those early morning radio presenters; they have need not only of arising at stupid o'clock, but being in at work an appropriate amount of time before start, in order that they might familiarise themselves with the two or three hour task ahead. you'd hardly think a working week such as the aforementioned would make for an easy cycling obsession. yet matt barbet, presenter of the news hour on itv's daybreak tv show has the same schedule imposed upon his person. this, you would imagine, would come as something of a shock to the system, as matt previously worked at channel 5 presenting the teatime news. then, he could almost have rolled out of bed around 3:30 of an afternoon and still been early for work (only joking). however, as most of us will know, the job that pays the bills is not necessarily the job we'd have plumped for given the choice. 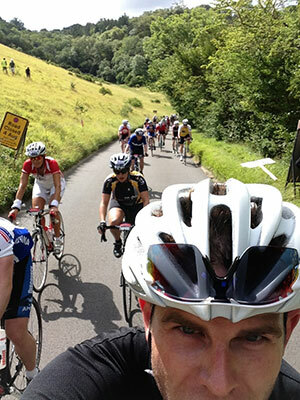 in cycling circles, matt's almost as well or better known for his exploits and interest in two wheels, even having recently appeared on the couch in itv 4's the cycle show. however in his case, was television presenting something he was aiming for, or was it an opportunity that offered itself? "a bit of both. i started as a journalist, first and foremost, and that's how i would still describe my job above anything else. 'tv presenter' covers many areas, and some i'm not sure i'd be suited to. however, it's broadcasting that i quickly got a passion for, working on the student radio station when i was at cardiff university, so that's when i focussed on being in front of a microphone. i've worked on radio a lot, via bbc radio 1, 5live and - online - monocle 24, and that's what eventually opened doors to the world of television." in my past days working at flight catering in an international airport, we had an internal joke that went something like this "what's the difference between a week in the operations department and a week's holiday? nothing at all.. that, of course was particularly untrue; the folks in operations worked every bit as hard as the rest of us, it's just that the bulk of their job was over and done with by the time the rest of us rolled up for the day's travaille. and if the aircraft hadn't landed, they'd not much to do. it is therefore easy to poke the same contentious whimsy at news presenters, whatever time of day they arise. matt's on-screen for around an hour, probably at least seven hours less than the rest of us spend at work. but how much more involved is the job off-screen? "a lot, as i'm sure you can imagine. i don't just rock up a few minutes before 6am and leave as soon as the weather is on just before 7. my alarm goes off at 3.30am, and i'm in the newsroom about 45 minutes later. news is a constantly changing beast, and while it might not be in full metamorphosis at that time in the morning, things do still happen, while our own opinions come into play regarding the importance of one story over another, and how much time we should spend on one item, etc. put simply, surrounding what you see on-air, is an awful lot of honing by everyone on the team to make sure our scripts, guests, interviews, correspondents and many other components are the best they can be. we also discuss afterwards what worked, what didn't, what could be improved, what should be revisited. it's an evolving process. what people see for that hour is really only the tip of the iceberg." there's no denying that stupid o'clock is darned early, much earlier than my alarm going off at 6am. yet even though i'm usually in bed between 10:30 - 11pm, i still look and feel as if i've been dragged through a hedge backwards when i shuffle into the kitchen for breakfast just after 7:30am. so if he has to be a picture of health and vitality just as my alarm sounds, boring though it may be to have to answer yet again, what time does he go to bed? "it varies, but usually around 9pm. i have two young daughters, so quite often i'll eat with them around 5pm. it's a peculiar existence, not least for my wife." when mrs washingmachinepost spent a week in glasgow recently visiting our daughter and newly born grandson, i made the supreme effort by arising an hour earlier than usual and nipping out for around 25km before breakfast. i managed that for the entire week (though mystifyingly not at all since her return), a remarkably pleasant and refreshing routine. however, getting up and about at 3:30am after going to bed around 9pm would seem to preclude anything like the opportunity to nip out on the bicycle in this manner. do these constraints engender a more unorthodox cycling schedule that for the rest of us? "it does mean i can cycle during weekdays more than most, but it's surprising how many other people have jobs that are flexible enough to allow them to ride then too. i miss not going out for a ride at the crack of dawn when the roads are quiet, and even though i occasionally do that on a sunday, i tend to do my longer, 100km plus rides during the week. i do subscribe to the graeme obree school of training of not doing it when i'm tired or don't feel right, and i'm probably more attuned to the importance of rest than i used to be, as a result of the job." as you are no doubt tired of of me and pretty much everyone else reminding you, in the light of britain's success at the 2012 olympics and two consecutive british winners at the tour de france, cycling in britain has taken on a rather greater importance than was once the case. however, without giving away matt barbet's age, his interest in cycling substantially pre-dates it's current increased popularity. what brought this interest in cycling as opposed to other sports? "well, it's not opposed to anything. i'm still a football fan, and have supported liverpool since i was a young boy. i enjoy most other sports too, and love a decent test match, whether its cricket or rugby union. however, i distinctly remember how much more exotic road-racing looked on channel 4 all those years ago, and i can also vividly remember hearing about stephen roche winning the tour on the news. it was almost as if it were a home victory, despite his being irish. i wouldn't say i was an avid follower then - and i'm still learning now - but it's the big names of the time that piqued my interest the most. the likes of indurain, virenque and pantani. again, and it's not that long ago, i remember when i heard about pantani's death. so sad, given his (admittedly drug-fuelled) heroics. i guess it's the fact that there was so little british involvement in the late 1980s and early 1990s that made the sport so attractive. now there is, in the form of sky, wiggins, froome, cavendish and others, makes it perhaps more interesting, but in a different way. in fact, i love the way one's interest in it can ebb and flow along individualistic, nationalistic or stylistic lines, or even for no particularly tangible reason. some riders i love just for the way they ride, and not because they win a lot these days. danilo hondo is one. i just love the way he rides a bike. i also love the way vasil kiryienka falls off one!" and perhaps to expand on that just a tad, why not mountain biking as opposed to road racing, considering the former was massively more popular at the time? "i grew up in north wales, so did ride mountain bikes and bmx with my brother around the hills. i craved a muddy fox, but never got one. i actually had a peugot, and maybe it was the brand's road-racing heritage that rubbed-off, i don't know. puch was another brand i liked, but never managed to get one. i'm easily as much of a cycling nut as the rest of you, with an intrinsic interest in road cycling and its racing offshoot. however, as i have maintained until i'm blue in the face, not only do i have little or no interest in training of any form, i absotively posilutely have no intention of pinning a number on one of those back pockets and attempting to beat others doing likewise. has matt succumbed to the attractions of amateur racing, or does he, like me, simply attempt to ride his bicycle very fast at weekends? "it's something i've considered, but i think it's just too risky. i do have a provisional licence, and friends who do race at various levels from cat 3/4 up to elite and pro, reckon i could cut it in the lower reaches! crashing would be a disaster though. i'm self-employed, so that's one reason i wouldn't want to stop working, but in my line of business being off-air for too long isn't wise, nor is sitting on the sofa with a broken collarbone. i've dabbled a bit in media-related races, and i pushed myself to 4hrs48m for last weekend's RideLondon 100, but that - and Strava - is about as far as it goes for now. I'm not ruling out getting a TT bike, mind you..."
and though his training was as a journalist and subsequent broadcasting, did he ever harbour thoughts of taking on the mantle of professional racing cyclist? "no, i didn't. my interest is much more developed now, and it's clearly too late, unless a pro-team reckons i could be some sort of very late-blossoming Jens Voigt. i wanted to be ian rush when i was growing up." somewhere on the interwebs you will likely find a series of statements attesting to 'you know you're a cyclist when...', statements that are intended to be humorous, but more often than not are remarkably close to the truth. 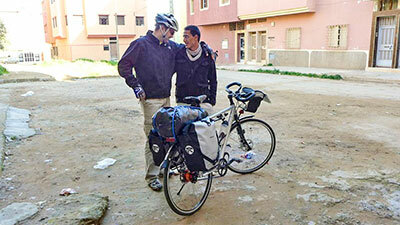 you know only too well that the minute you've fallen off your bike, first concern is often for the bicycle. it's hard to detect when interest stops and obsession takes over; i've no idea when it happened, but i'm quite comfortable to raise my hand as a cycling obsessive. is this the same for matt, even if he regards it as a healthy obsession? "yes, i probably am, but i think it is healthy. it certainly keeps me healthy, and that is the main reason i enjoy it. healthy body, healthy mind. the side benefits like enjoying bikes, and kit, and sunglasses and those 'petit peloton' figures are just that - side issues. 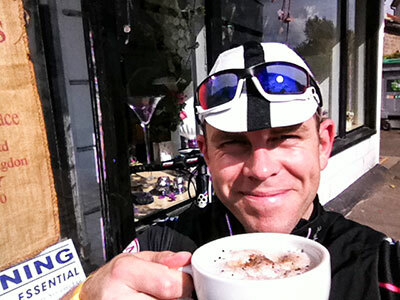 but if i don't get out for a decent ride at least a couple of times a week, i can be quite irritable." itv4 presenter ned boulting is on record in his first book (how i won the yellow jumper) as admitting to being less than au fait with the ins and outs of professional cycling, despite having been parachuted into the tour de france as part of the televisual team. allowing for the fact that their contracts are with different broadcasting companies, can matt ever see himself joining ned to present the tour de france? "clearly, ned is irreplaceable. i'm a big fan, and we do know each other. i like what i do now, and although i'd never say never, i know other people who work in the sports they love and they end up not loving them anymore. the passion they once had goes, and it becomes just a job. i realise that's not true of everyone, or you get those - like ned - who started covering cycling knowing very little and then becoming genuine experts, but i don't think i would want to risk losing my enjoyment." in common with many other tv personalities, matt has worked for more than one employer over recent years, and there's no doubt that the broadcasting freelance world involves twists and turns that do not apply to the rest of us. arising at 3:30am each weekday could perceivably become a tad tiresome after a while, so what may lie ahead in both roads of matt's dual existence? "no other plans, work-wise. just continue doing what i'm doing now and enjoying it. i've dabbled in writing about cycling, for cycling plus, rcuk and now cyclist magazine, so again, more of that would be good, on the side. as for cycling itself, well again, more of the same. 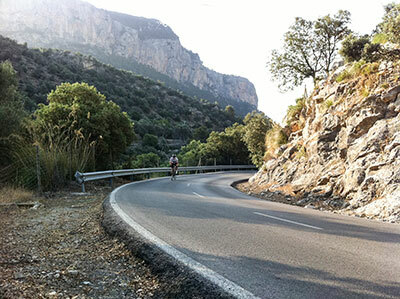 i've got an etape under my belt, as well as london-paris and tours-london, so more along those lines would be great. i've never ridden in the pyrenees, so it would be nice to tick off a few of those monster climbs, while i've long thought the annual week-long cycle oregon ride looks a lot of fun. i love that state anyway, as it's utterly beautiful. given it's probably the most cycle-centric place in america, and i have two american bikes i obsess over in a carbon Parlee and a steel Independent Fabrication, it seems like it should be spot-on." though i have engendered an infrequent number of e-mails over the course of the years bemoaning the fact that the post contains no capital letters, i am inclined to leave them in situ when an interviewee uses them in reply to my questions. genuinely nice bloke that mr barbet is, he commenced his response to my queries with "here we go, and i've tried to keep it lower-case!" mrs washingmachinepost and i own our house midst a small collection of former council houses in the environs of bowmore. though it featured not as a necessary feature when making the purchase, the scheme is essentially car free, or at least that's what the architects originally intended. we originally lived in a small version only a few metres away, but moved to our current abode when the arrival of number one son dictated the necessity of a third bedroom. at that time, the substantially sized car park that forms part of our door to the rest of the world remained mostly unoccupied, and i do recall wondering what on earth they were thinking in the late 1960s to have made such abundant space available for the motor car. i'd like to think that the current traffic conditions that exist in a tiny village of about 1000 persons had been foreseen by those 1960s planners, but i seriously doubt that such was the case. that all but empty car park is now home to so many cars that my neighbour two doors down has converted his front garden into a driveway in order that he might find solace for his own vehicle. there have been frequent occasions recently where car owners have had to park their cars more or less in the centre of the car park because there was simply nowhere else for them to go. it might be worth my pointing out that the two similarly sized parking areas within close proximity need only satisfy the parking demands of around thirty houses; the big problem is that on occasion there are up to three vehicles for one house. easing the problem not one whit, but a directive with which i totally agree, the housing association that owns the majority of properties decreed that no vehicle must be parked in the turning areas that terminate each walkway. this has its basis in pragmatism, for it is not so long ago that an ambulance was unable to reach a particular house due to a car blocking its access. thus several motors were subsequently moved under pressure into an already overcrowded car park. adherence to this diktat is mostly conciliatory, but every now and again my passage from house to work is interrupted by an illegally parked car, right outside the owner's front gate. at which point, i have to wonder why it is seen as so necessary to exert the right to park a vehicle as close to the front door as possible? this situation is not simply contained within my immediate locale. at the top of main street a young lad and his partner have two vehicles, one of which is inevitably parked on the pavement (sidewalk), again, right outside their front door. the iniquity of this positioning is that the portion of pavement on which the vehicle is parked has had the kerb lowered to ease access for kids walking to school. these kids are now required to cross elsewhere, or negotiate either a works van or a small compact. it would be comforting to think that the local police might take a dim view of this unecessary parking, but in fact, they appear to take no view of it whatsoever. under scottish law (and uk law i believe), it is not illegal to park on the pavement (surely a law that needs changing? ), but it is illegal to drive on it. despite the fact that the former inevitably entails the latter, nothing can legally transpire unless a policeman catches the driver in the act. timid as i am, i would not have the cojones to try, but would dearly love to ask a local policeman whether he would find it a transgression if i parked a motor car on the pavement outside the local supermarket in the middle of main street? i have every confidence that they would attend such a scene in a matter of seconds and forcibly direct me to remove the vehicle forthwith. just a hunch. it seems particularly sad that, despite the amount of roadspace that has blighted much of our land, in order that the car ought never to be more than a few paces from the front door, even folks in little island villages succumb to parking on the areas especially set aside for the hapless pedestrian. but even though i harbour my irritations in this respect, they are but a tiny fly in the ointment compared to those that exist in other towns and cities around the world. rome, for instance. 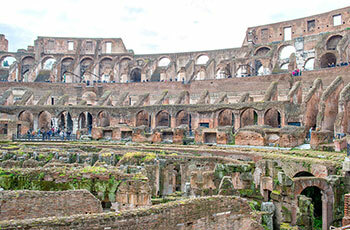 built between 70 and 80 ad, the colosseum is the largest amphitheatre in the world and considered possibly the finest example of roman architecture. 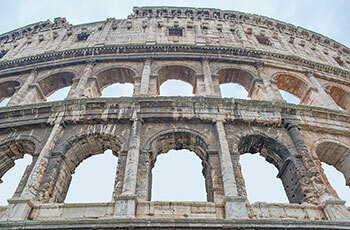 assuming it were still to be in its original condition, it is reckoned to have held between 50,000 and 80,000 spectators. in modern times, it is a major tourist attraction, by all accounts, an attraction that is hardly set in ideal surroundings. 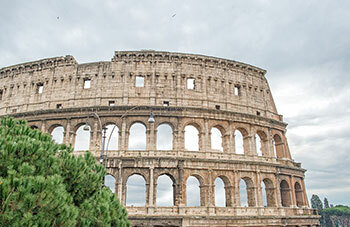 rome's traffic management, hardly the best advertisement for one of italy's major cities has, in effect, converted this ruined colossus into a glorified roundabout, a situation that, thankfully, seems to have been taken in hand by the city's new mayor. having transitioned from a career as a transplant surgeon, ignazio marino has declared it his intention to 'pedestrianise historic parts of the city'. though i assume as mayor of rome he would have at least one official vehicle at his beck and call, marino often cycles to and from council meetings, stating "We must choose whether we want cars, or to value our monuments. 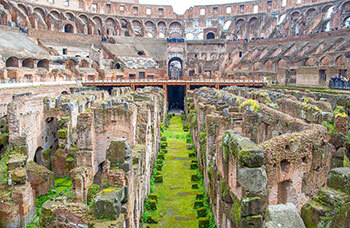 I don't think any other city in the world would have turned the Colosseum, probably the most famous monument on the planet, into a roundabout." you'd be surprised if i didn't find this a laudable aim, and there seems every likelihood that he will attain most of his restrictions on cars in strategic parts of the italian city. truly we could do with a greater number of folks in high places with the fortitude to challenge the huge infiltration that the motor car has made into our daily lives. we could sure as heck do with a few in the uk. i wonder if islay's community council could maybe borrow him for a month or two? 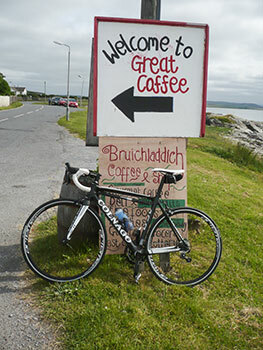 about ten years ago, i bought a colnago c40 hp and kitted it out with a campagnolo chorus groupset. those bits cost me £2,000. yes, there were still the wheels, bars, stem, saddle etc to add on top, but it seemed a fair price at the time because than i'd be the proud owner of a carbon fibre colnago. pop forward a decade and things have changed just a bit. carbon fibre is everywhere, and there's now very little of it made in italy, certainly not at cambiago. the modern-day equivalent of the c40 is arguably the c59, a frame that still employs carbon tubes and lugs, except one of these costs more than £3,000. with the advent of colnago's 2014 range, £2,000 once again becomes a landmark figure in the shape of the replacement for the colnago ace; the colnago ac-r.
with exotically priced carbon fibre becoming ever the norm nowadays, the price of entry to this once almost unattainable realm has risen in tandem with the price of pretty much everything else these days. but you have to admit that a complete colnago bicycle for £2,000 has its attractions. does the promise equal the desirability? a young friend of mine is carrying out research into the more arcane dietary requirements of the common man. or woman, come to that. and in the process of doing so, i was asked, as a vegetarian of some considerable standing, as to my opinion on the availability of vegetarian food in the average hostelry or food establishment. as one who fails to get out too much, my answer had mostly to be constrained to my experience of those within my immediate locale, which inevitably led to me recounting a true but perhaps over-tired recitation that encapsulates all that is often wrong with the quest for dietary satisfaction. many years ago, at christmas time, members of my family descended upon washingmachinepost croft with notions of heading out to a local hotel for christmas dinner. as mine host, i felt it my responsibility to book a table at a local hotel (currently no longer in business, as it happens). as my daughter and i are both vegetarian, i dropped this nugget of information into the telephone conversation, at which point i was asked to qualify whether i required vegan meals. in order to remove all doubt as to what and what did not constitute a vegetarian meal, i signified (untruthfully) that vegan would be ideal. it's worth pointing out that i do likewise on transatlantic flights too. come the pre-booked meal itself, my daughter and i looked forward to the culinary creations that awaited our approval, apprehension that was totally undermined by the starter and main course served. the former was cream of tomato soup (for the uninitiated, vegans do not consume dairy produce), while the latter consisted of a prawn salad. no matter, apparently, that vegetarians do not eat shellfish, never mind the strictures of a vegan diet. since then, things have gone from good to worse. in the years when it appears that vegetarianism was fashionable, many a restaurant or hotel would feature several non-meat options on the menu. this has now unfortunately devolved to an often italicised 'a vegetarian option may be available. please ask for details'. well, as a potential paying customer, i would like to have at least two options from which to choose, rather than having to accept whatever it is that the chef may have spent the odd moment throwing together in the kitchen while muttering under his/her breath. you're right, i am beginning to sound like an episode of grumpy old men, but she did ask. fortunately, i rarely eat out, partly for the reasons outlined above, and partly because i have other things on which i would rather spend my money. one of which, now that you come to mention it, would be a copy of anna brones' rather excellent book. unfortunately, unless i could persuade mrs washingmachinepost to peruse its illustrated chapters on a frequent basis, i would disappoint not only ms brones and elly blue, but undoubtedly myself. for i have convinced myself that cooking and baking are not factors safe from my incompetence with an oven. when at art college there were a couple of folks in my year who were confirmed vegans, frequently looking as if they could do with a decent meal, but in retrospect that's a description that could readily have been applied to many of those at art college in the 1970s. since then i have often toyed with thoughts of assuming the vegan mantle, but my intrinsic reticence to accept external dogma, has kept me to the middle way; that of the self-satisfied vegetarian. i like to think that anna brones would heartily approve. as a basis for this assumption, many of the recipes contained within the culinary cyclist feature options that not only differentiate between vegetarians and vegans, but also cater for those who either desire a gluten-free diet or those who are constrained so to do as confirmed coeliacs. as one without the self-imposition of veganism, or gastric requirement to exclude gluten, the options available with each and every recipe are a positive delight. let me disavow you of any notion that these are the sort of recipes that chris carmichael would be recommending to his endurance athletes. this is not to suggest that their consumption would in any way harm those undertaking an ironman triathlon, but the primary thrust of peanut butter cookies, chocolate sea salt cake, dutch apple pie with cardamom and quinoa apple spice cake is in satisfying the calorific requirements of the average, about-town cyclist, while taking care of any dietary needs, whether they be vegan or gluten-free. when did chris carmichael ever offer to show you how to make home-made nutella or raw walnut butter? 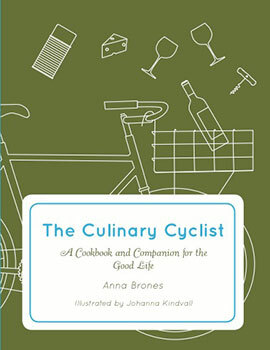 the culinary cyclist is more of a book with recipes than a recipe book per se, a relatively slim volume containing excellent advice and thoughts on diet, cooking, ecology, ethical practice, along with the occasional anecdote. add to that the beautiful and delightfully simple line-drawings of johanna kindvall, and this becomes a remarkably inviting set of chapters. it does, however, occasionally betray its portland, oregon roots, where it is hard to turn round of a weekend without tripping over a farmers' market. the farmers hereabouts, engaged as they are in the practice of rearing cattle and sheep, would scarce give houseroom to a cook book encouraging veganism. and were we to be blessed with a farmers' market, i seriously doubt the stalls would be garnished with kale, pulses, seeds or freshly roasted coffee beans. add to that a single supermarket with no noticeable predilection of catering to odd dietary requirements, and i might just have to put heart and soul into acquiring several of the ingredients required for anna brones' recipes. if you are more centrally situated, however, on either side of the pond, such strictures may have never raised as much as an eyebrow. however, this would comprise a review based solely on observation rather than practical consumption had i not attempted at least one of the recipes contained within. though proffered as the ideal breakfast, i confess my experience was rather later in the day, but baked with my own fair hands, despite a total lack of culinary expertise. baked egg in avocado is simplicity itself even for me, but comprises two principal ingredients that i would never have conjoined in a month of sundays. in truth, the end result was little short of stupendous. guess who's having supper again this evening? if we can briefly return to my non-training stance, it's worth my pointing out at this early juncture that i still retain the right to defend my complete lack of participation. well, sort of, because in order to actually complete the ride of the falling rain, (which is exactly what i did on sunday) in a reasonable time and without collapsing in a heap at day's end, i found it necessary to previously ride one or two kilometres. maybe more than just one or two, but honestly, who's counting? in the true spirit of semantics, it depends greatly on which particular interpretation of a specific word you wish to adopt as to its intended meaning. therefore, though over the previous two weekends, the fact that i rode in excess of 170km, to my mind, this in no way constitutes training. honest guv, i was only riding my bike. but were i to capitulate and find it necessary to consult outwith the pretence of non-training, there is a veritable bookshop of volumes covering each and every aspect of just how to successfully attack the problem (if it is, indeed, seen as a problem). these range from endless chapters covering weekly and monthly schedules, specific exercises that will charge my muscles and those which detail nutritional and dietary specifics. it is notable that more recently these latter volumes have incorporated dietary variations; in my case the desire to remain a vegetarian in the pursuit of cycling happiness. this may seem an unremarkable point, but i have recall of purchasing a training book many years ago by the infamous eddie b who was unconditionally disparaging about those who would consider anything other than a diet of steak, steak and more steak. however, the very fact that the more contemporary of these nutritional authors is happy to discuss coeliac, vegan and vegetarian diets gives rise to the observation that nothing stands still for long. perceptions change on a regular basis, and what was once regarded as unchallengeable dogma, is now looked upon as somewhat old hat. that not only applies to food consumption, but also that of liquid sustenance. common thinking generally advised that the active cyclist ought at the very least to commence sipping some water within ten minutes into a ride, then continuing to do so every five minutes throughout the remaining distance. 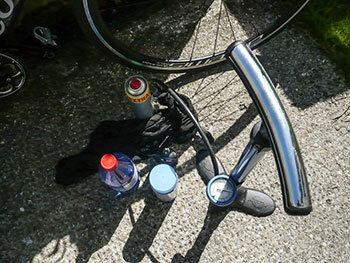 you can likely calculate for yourselves that on a two hour plus ride, that's a not inconsiderable amount of liquid, necessitating either a larger bottle, two bottles, or a scheduled stop to refill along the way. but what of the hapless individual who not only continually forgets to drink anyway, but who plainly needs less liquid than that dictated by the experts? well, the most recent studies on this have apparently changed tack slightly. whereas there was a preponderance of advice that stated one shouldn't wait until thirst rared its ugly head, always keeping at least one step ahead of it, current thinking would appear to point out that thirst is the very indicator of needing to drink that we all ought to heed. though i've absolutely no experience in this area whatsoever, i've pretty much always found the latter to be particularly true in my case. more often than not i'd return from a two hour ride with the same amount of water with which i left home. now before you all scream and shout at the apparent stupidity of my actions, in truth, this lack of absorption of liquid seems not to have made any appreciable difference to either the efficiency or enjoyment of each bike ride. i, along with others, find it quite hard to drink regularly if i don't feel thirsty in the first place, a situation that seems more in keeping with revised nutritional thinking. thank goodness. however, the 162.5 kilometres that constitute the ultimate distance of the annual ride of the falling rain certainly begin to infiltrate the bits where i'm pretty darned sure i'd need to have at least the odd sup of water. add in only a smattering of rain (just enough to keep trading standards at bay) on a day which saw the wind drop consistently over the course of time and the temperature rise close to 20 degrees, and it would need to be a mad dog or an englishman who ventured out in the mid-day sun without a substantial bottle of water. that which slotted into the colnago bottle cage on my bicycle for the day, was the latest from dutch cycle component and accessories purveyor bbb. their autotank can be had in two variations; the standard 550ml autotank and the larger 750ml autotank xl. 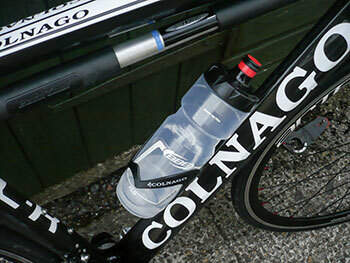 it was the latter that augmented the colnago's downtube. so it's a water bottle, which observation will obviously confirm, but it's a water bottle with a twist. or rather, it's a water bottle without a twist. 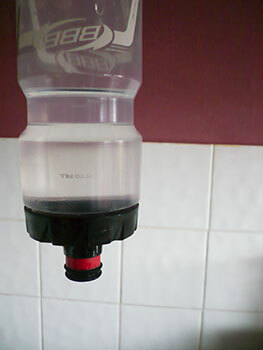 it features an autoclose valve, preventing any of the contained liquid from finding its way out of the bottle unless given an encouraging squeeze by the owner. the valve can be completely closed by being left in the down position, or pulled upwards (with teeth if necessary). the latter is the preferred position when out riding on the bike, and it's a system that works quite effectively. however, there is a slight downside, or perhaps more accurately, the perceived need for a minor alteration of slurping technique. with a regular bottle i am inclined to hold the bottle at an angle to my mouth; drinking sideways almost. however, due to the shape and size of bbb's autoclose valve, that's a less than pragmatic approach, the bottle having to be held pretty much in the straight ahead position. 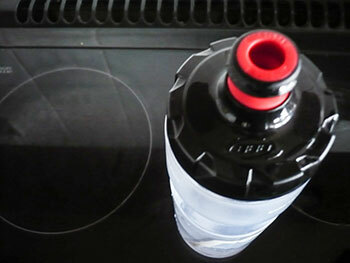 that way, when the bottle's squeezed, you don't dribble all over the top tube. though i didn't get the chance to test the theory, a full bottle placed in a kit bag with the valve closed or even left in the up position, ought not to saturate the other contents of the bag. 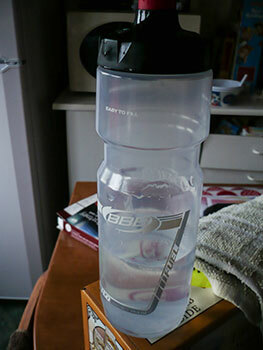 what i did attempt with success was to place the bottle in the cage while the bike was stored in the bikeshed at an angle pointing the bottle downwards. this is something i have stupidly done with a regular bottle all too often, with the resulting puddle of water under the frame and on the downtube. the autotank left the floor in its preferred dessicated state. perhaps you are more conscientious than i, or even less careless, in which case the autotank might not be considered a necessary option. but i bet you're not. i've sort of promised myself that i will not enter any lengthy diatribes concerning the archetypal errant holiday visitor who has miserably failed to check the bicycle prior to leaving home. the apocryphal character of whom i speak - and it may very well have been you - has surely been offered sufficient pixel room to have lodged in the psyche of most. even now, in a holiday location far, far away, there will be an un-named cyclist removing the cycle from the roofrack and the left crank will fall off. those are probably the only moments in life when anyone thinks of me. the dangers, not of being mechanically superior, but of scarcely concealed self-righteousness are manifold. 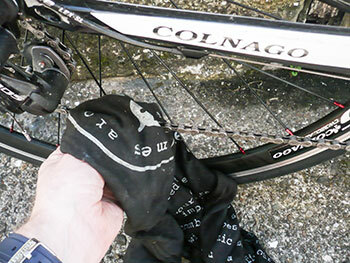 how embarrassing is it to be on the sunday ride with those sick to the back teeth of endless moralising, only to discover that when a puncture bites, the saddle pack with tyre lever and spare tube is still carefully affixed to a bicycle still sat in the shed? and not the one currently being ridden. it should never become a case of 'do as i say, not as i do' if only because someone will make you pay for the coffees after being such an idiot. thus i have the luxury here of mentioning (once more), the ride of the falling rain, islay's annual 100 mile perambulation of the estates and even a real live distillery at which modest quantities of whisky were available. islay is a friendly place, not only by the indigenous population to the indigenous population, but to those visiting for only a short period. when i was last in the position of visitor before i became domiciled, i undertook a ten mile charity walk from port ellen to bowmore. with unfailing frequency, car drivers stopped on the low road to offer me a lift to my destination. and what's even better is the fact that it would have been completely safe so to do. there are few enough places where that remains true. therefore, undertaking a bike ride potentially of 100 miles held no real fears on any score. even if the entire bike fell to pieces in one of islay's more remote locations, at some point, someone would have wandered into view and offered assistance. however, pride and pre-planning are not out of place simply on that score. yes you'll always get home, but surely it is preferable to do so under your own steam? i would generally think so, and in order to ensure that this was at least a serious possibility, i took what i thought to be at least minimal preventative moves. 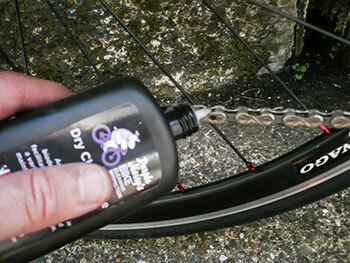 the obvious things: inflating the tyres to the desired pressure, degreasing and lubricating the chain (thank you purple harry) and the less obvious: polishing the frame and levelling the garmin mount relative to the stem. and despite having a spare inner-tube in that rapha saddle pack, i popped another spare in a back pocket. i cannot deny that having a brand new, only just out the box bicycle to ride made things a lot simpler. all the shiny bits still have their original lustre, and after their polishing, could probably have been seen from the intrnational space station. 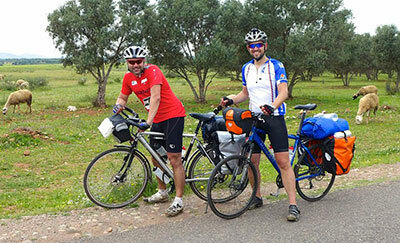 on the off chance that you too find yourselves about to ride great distances on your bicycles, don't find yourselves in the situation of having to pay for the coffees. am i not a good boy?